The 100 has reached its Season 4 finale, and the death wave finally makes its presence known — creating a thrilling episode to conclude that promises to drastically change things up for The 100. If that isn’t enough, the episode includes plenty of massive Season 1 throwbacks and a potential hint at what trouble is on the way for Season 5. In the semi-safety of Becca’s lab, the small space-bound group watches the death wave roll through land, completely wiping Polis out of existence before their very eyes. The drone is destroyed in the process, leaving them blind to what comes next but Raven realizes they are extremely limited on time until it eventually reaches the crew. The preparations for a five year space journey commence, but Clarke and Bellamy take a minute to have a one-on-one conversation about Clarke’s concern for her mother’s visions of her dying (Raven had accurate visions as well.) Clarke also reiterates to Bellamy that she has no doubts that he is a completely loving person who has done nothing but his best efforts to care for his sister – as if they want affirmations that the decisions they’ve made thus far are acceptable. With time running out, Monty and Murphy are granted the task of obtaining an oxygen scrubber and in the process, Monty removes his gloves to do so causing his hands to burn from radiation (very sacrificial of Monty to do so.) They try to carry the necessity back to the lab, but Monty passes out from the pain and that’s when Murphy makes the choice to leave Monty and take the oxygen scrubber back before time runs out. At the same time, an explosion is set off at the lab and Raven begins to worry that they are trying to make this trip too quickly – also now lacking an important communication system to establish power/connection. Raven realizes that it can be done another way (through the satellite towers similarly to ALIE’s transmission from before) and Clarke takes on that task so Murphy and Bellamy can go back for Monty. Monty regains consciousness just in time and is helped back to the lab – but now Bellamy realizes that Echo has vanished to cover her face in paint and blood as a sacrifice. Bellamy is quick to tell her she’s needed to survive but Raven is under high stress levels and doesn’t have any time for random freak-outs (get with it or get going Echo!) The clock is ticking so Clarke is forced to climb the satellite herself to manually connect to the ring and give the remnants of the ark / station power. Just as they are out of time, others hope to wait it out for Clarke but Bellamy states that she would want them to leave (Season 1 nod) so they seal the hatch and prep to launch. The ship is next seen space bound as Clarke watches from below, before reaching the top of the satellite with nearly moments to spare, connecting successfully and granting them power that they won’t know about until they actually arrive to the space station. With all of the space crew feeling guilty about Clarke, they see a feint light that indicates Clarke was successful – as they are nearly ready to dock their ship. Clarke is next seen making her way back to the lab, falling and cracking her helmet, leaving her covered in radiation burns and a power loss – while we see the ark group wake up (Bellamy saved them all by connecting the oxygen scrubber) and they look to Earth to discover parts of the planet are now seemingly burning due to the radiation, looking as if survival on the Earth is an improbability. Now things get a little interesting next – as we skip six years and seven days to find Clarke trying to establish communication with Bellamy. Clarke (with a haircut and red streak) attempts to let them all know the Earth has been livable for a year now but there has been no communication with the bunker that has since been impossible to access through excessive rubble. Clarke hasn’t heard from the space group either, but sees a ship in the distance that appears to be attempting an Earth landing. The former leader turned guardian wakes up a little girl in her rover (named Madi) who is referred to as Nightblood and suggests she is excited to reconnect with her friends. The excitement is cut very short however, as Clarke and Madi realize this is a much larger ship that is a prisoner transport from the mysterious and or ominous “Eligius Corporation.” Just like that – The 100 concludes its fourth season by addressing the death wave, yet now an entirely different problem presents itself and suddenly I can’t wait to see what the fifth season has in store for us. The 100 knows how to deliver a solid finale episode, so this sense of coming full circle was the most appropriate decision this season. I was glad to see the death wave has been addressed, but this next season already feels like it has potential to be one of the strongest yet. I also truly enjoyed the time jump, giving us new storylines and character changes to focus on that differ from what we have already experienced. The 100’s season finale is another poignant reminder of how powerful and suspenseful a show can be after several seasons and that it’s the best sci-fi series on TV, one of the best dramas and CW’s absolute best example of current programming. – Holding out hope that Octavia is safe and leading with excellence, but my gut says otherwise. – I was glad to see Clarke offer herself up, but I think it showed more of her feelings for Bellamy than anyone else involved. – The ending scene essentially restarts The 100 with a new perspective and now the characters we know are the true Grounders. – I have enjoyed recapping, reviewing and covering the season once again – I absolutely love the series and having the opportunity to truly geek-out with others who share the same passion. May we meet again next season! 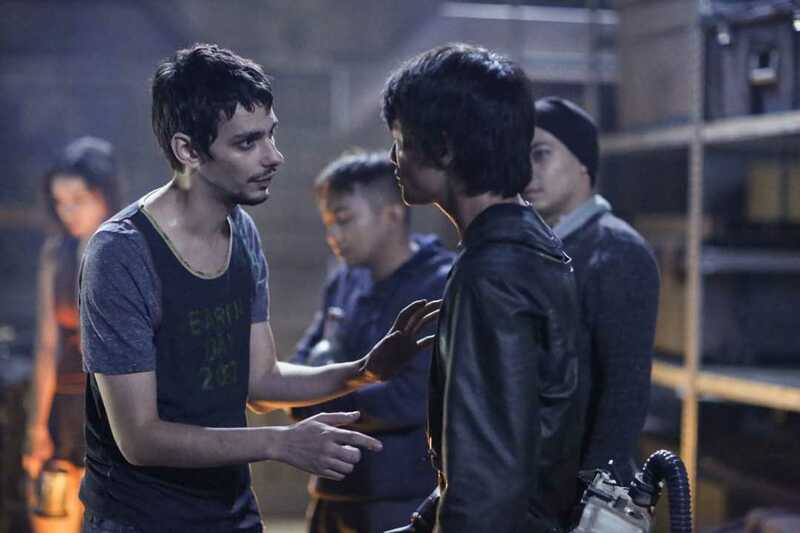 Last week on The 100, things got pretty dicey — and we still aren’t even at the finale yet! After losing Jasper, Clarke flip-flopping her sketchy judgement calls and Octavia proving to be the truest warrior queen the earth needs, The 100 jumps into yet another chapter with chaos and conflict as we head toward the conclusion of the fourth season. Initially, it seemed as if Octavia’s idea to let the bunker belong to all people was a solid plan — until Clarke and Jaha showed their hand by removing trust from the equation. Now that it is open again, the grounders take over the primary levels, and Skaikru is left to pick their list of 100 (excluding the obvious characters we know and children). Clarke and Bellamy are secured beds in the bunker, but, in an attempt to not feel as soulless as Clarke has been in the past, they decide to venture out in search of Raven to bring her back before they need to seal it off from the death wave. Murphy and Emori tag along, causing Abby to grant Murphy a spot — but not necessarily Emori. Murphy reveals to Bellamy that he is mostly just wanting to make it to Becca’s lab because, although it isn’t a safe haven, it’s still the most solid chance that is primarily unknown to others. Unfortunately, that bothersome troublemaker Echo overhears the tea and now has potential to piss people off yet again. Back where the decision is being contemplated, Kane shares the lottery concept with his people and is predictably met with some animosity. Backlash begins to make its way to Niylah, but Octavia puts an end to the aggression with her newfound position of power or at least intimidation. Jaha tries to get Octavia to help “her” people; however, Octavia is quick to point out the hypocrisy after living in the floor of a spaceship and the unnecessary death of her mother at their hands. At this point, Jaha and Skaikru are purely lucky that she feels the need to look out for anyone other than herself and her brother. With things settling down, the process to determine the new 100 (or 80 something) commences, and Miller’s father offers his son’s name in place of his own to better Miller’s chances at surviving — way to go pulling at heartstrings! Abby additionally takes the time to tell Kane he’ll draw an extra name because she doesn’t feel right being guaranteed a spot over anyone else. Despite the fact that she’s the primary doctor of the entire group, maybe Abby is just kind of over the whole survival concept? Just when you think things will go relatively smoothly (in a life or death fashion), Kane catches Jaha leave the drawing in a very unreliable Jaha-esque manner, so he takes it upon himself to see what Jaha is concocting. Kane tracks down the former leader of Arkadia, and Jaha shares his plan to gas the Grounders out of the bunker and threaten them with destroying crops, but, fortunately, Kane is able to convince him it is — first and foremost — a horrible idea that nothing good will come from. Having already riled up the crowd, Octavia and Indra open the door to the riot and find the entire crowd was gassed to cease any further rioting that could get them all killed. Instead, they use the list Clarke compiled episodes back which exchanges the lottery idea entirely and is an easy cop out to pin on her (just from an observatory standpoint). Kane picks out the unconscious group of people, which includes Abby, and the decision is made – casting all others not picked to the outside area where they will be left to live out their remaining time before the radiation sweeps the area. Bellamy and Clarke are on their way to save Raven but have a chance to reconnect and try to move past their issues (Bellarke fans forget the whole ‘nearly killed you’ aspect). The powwow is cut short when they hit something with the rover, and Bellamy steps outside to see who he hit. The four are then ambushed by Grounders who nearly kill the group until former problem child Echo saves the day with a nifty bow and arrow. Echo (as it turns out) followed them to seek security in the lab Raven is located at, giving her an extra hazmat suit to protect from increased radiation. Emori coughs up blood shortly after, and we learn that her helmet was broken during the scuffle — Murphy opts to give her his own (aww), but Clarke gives her own to test out her newly-infused Nightblood. Clarke suggests that, if this test works, they can create more strains to save everyone, but Clarke’s plan loses steam when she begins to cough up blood too … back to the drawing board. 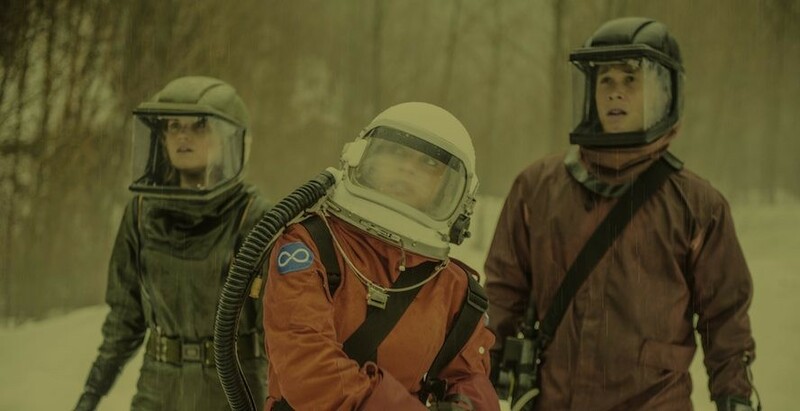 By the time Monty and Harper meet up with the others, they have an extra mask for Clarke (RIP Jasper), and it is evident that they missed the chance to pick up Raven and make it back in time to join those in the larger bunker made up of all factions. With the revelation that they can’t make it back, Clarke offers a new plan: go back to space. With the opportunities to survive dwindling, the eight decide they’ll use the lab’s technology to make a return to the station where they are guaranteed at least five years of survival (oxygenator, food, water) to figure out the next step. This was a rather strong episode that made the series come full circle (return to space!). The separation of groups, merging of societies and notion of a space shake-up brings The 100’s energy back to its prime. With one episode remaining and consistently impressive episodes progressing towards the finale, The 100 remains the best sci-fi-influenced series on television. – Sending a big part of the team to space for multiple years could create a great time-jump for The 100 to utilize next season. – Thank goodness Kane wouldn’t let Abby meet her end just yet. With Clarke having come up with a plan to overtake the bunker, Jaha and the rest of the former Skaikru make themselves comfortable despite utterly shocking everyone else with the rash decision. By the time Bellamy regains consciousness, he begins to clash with Clarke, finally calling her out for making choices she shouldn’t be deciding on her own. Abby realizes the same thing Bellamy has, and the evil duo of Clarke and Jaha allow them to at least radio their goodbyes to Kane and Octavia. Octavia fills her brother in on her victory so he takes an opportunity to say he will do whatever he can to get her inside the bunker and safe with the others. Jaha (who wasn’t so pleased about the radio contact) has guards shock-baton him to take him as a temporary prisoner with concern over what he will do next. As he is dragged away, Abby and Clarke aren’t too thrilled by Jaha’s orders (which Clarke is equally a part of, in my honest opinion), but Clarke finds Murphy to keep an eye on Bellamy. Murphy notices Bellamy bleeding from the chains (that tends to happen when one is held captive against one’s will), so Abby is sent to tend to his wounds. Bellamy had hoped this would happen, taking the opportunity to tell Abby he will do whatever is necessary to save his sister and Kane — Abby’s love interest, in case you need a refresh for the lack of Kane/Abby scenes. Abby frees him from his chains, and, although she isn’t sure he will succeed, she feels better trying than just allowing madness to ensue like her daughter repeatedly allows. Above ground, Octavia is surrounded by the other clans, who grow anxious over the looming sense of danger, with Azgeda becoming an issue due to Echo “dishonoring” her people. Octavia shows her true leadership attributes and explains that, even though she may not have played fairly, it shouldn’t reflect her entire clan — a round of applause for her sheer brilliance and forward thinking, right? Abby approaches Jaha for one last shot at persuasion, but he refers to Kane as if he has died already, so, in response to the shade from her former ally, she injects him with a sedative and aids Bellamy to the hatch, both working toward the same goal of opening the bunker. Just as he comes close to gaining access to the hatch, Clarke appears toting a gun aimed at her “friend.” She receives the talk she needs from him, pointing out that, if she allows this to happen, she’s completely responsible for allowing many others to die. Bellamy stands strong and says she will have to kill him if she doesn’t want him to open the door and Clarke realizes at least one horrible act she can’t commit — lowering the gun. Now the Blake siblings have a chance to reunite, and Octavia proclaims unity for all … just not Echo, which is totally understandable given all the treachery she has sparked. 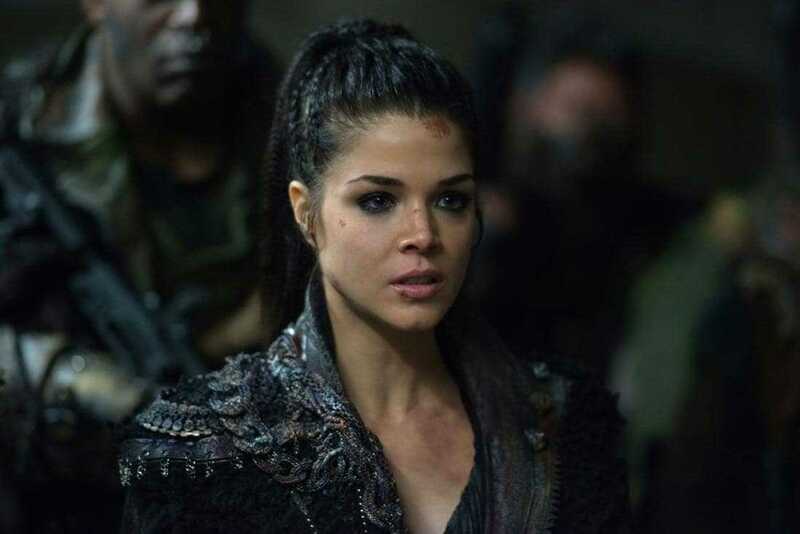 Octavia explains that, as long as she and her brother are given a spot, the remaining slots for the bunker can be determined by the powers that be (Clarke, Kane and Jaha). Elsewhere, Raven is realizing her time on earth is coming to an end and begins to see visions of Becca and her close friend Sinclair, with the new knowledge that she could (possibly) survive if she were to “reboot” her brain. How does one do this? Well, with the mix of an ice bath and defibrillator, of course! Shockingly (and semi-strangely) enough, her plan works, and Raven Reyes is back in the game. Monty does his best to convince a group of The 100 to join him in the rover and make their way to (semi) safety. The group (including Jasper, Harper and a few others) decide to follow Riley’s direction and agree that, with the correct amount of a dosage, they can end the suffering that very night. A surprising change of character shows Harper later tell Monty that he isn’t enough for her to want to survive and gives a pretty cruel breakup on account of the suicide pact — but the truly heavy moment comes from Monty and Jasper. Monty next finds Jasper staring outside of a window into the deep red moon, knowing that the end is coming for them eventually. Jasper asks his childhood best friend to tell him he loves him, triggering Monty to realize that Jasper has overdosed. He tries to stick his fingers in his throat to make him regurgitate the drugs; however, Jasper stops him and makes a joke out of the situation as only Jasper could. He kisses Monty’s hand with one final bit of life he has remaining and tells him he will “see you on the other side.” Overcome by emotion (Monty … and me), he repeatedly states his love for Jasper to make his feelings for his best friend known even though he had passed on moments before he could muster the words. After everything they had been through, it was apparent that Jasper was heading down this path after losing the potential love of his life, he was now a fractured person who wasn’t willing to fight on any longer. There have been several deaths in The 100 during its four seasons, but this one was an emotional punch to the gut. The only silver lining of the situation was that Harper didn’t actually go through with it, telling Monty she loves him (but I must admit I’m not to pleased with her after this episode). Now only two episodes remain, and plenty of characters are in danger of radiation, so any bets on who can survive the upcoming danger? Rest In Peace, Jasper. Your sarcasm, goofiness, scorned attitude and words of wisdom will be missed. After four seasons, he rightfully became a fan favorite who reflected some of the darkest moments of grief the series included. His story’s conclusion was one that could have been predicted by watching the slow deterioration of who he once was and his lack of interest in what the world around him had become — it’s just a shame he didn’t want to stick around to reshape what it could eventually become. Giving Jasper and Monty a scene for his send off was the most appropriate choice by far. Still waiting on that afterlife reunion for Jasper and Maya. Raven’s plan of survival seemed slightly insane, but, if it kept my favorite brainiac around, I am all for it. Clarke can try to do the right thing all she likes, but she will never make amends for the choices she has made at this point.